38, DaChuan St, Nantun Dist. 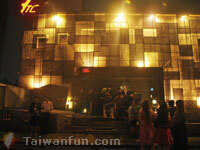 Among many veteran late-night Taichung partiers, the top "go-to" place has long been 18TC, widely considered the city's premier club. That status is borne out by the fact that it's best to arrive earlier rather than later, because by around 12:30 a.m. the lines to go in often get long. 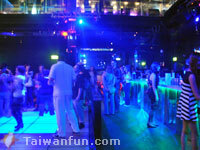 Inside, guests are greeted by massive doors leading to the bar and dance floor. As one might expect, the club is a fairly dark, with colorful lighting effects beaming through the air as energetically as the music pounding through ample speakers around the venue. You'll likely spend most of your time on the floor, usually packed with beautiful women and sharply-dressed young men, with the lighting and music adding to the blissfully chaotic ebb and flow of gyrating bodies. 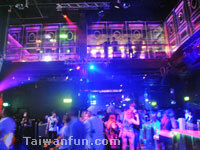 18TC plays electro, house, hip hop and Top 40 music, varying from night to night. There are also two separate areas—the main room, usually focusing on mainstream music, and a more lounge-like, upscale second floor mostly playing house and disco. Each of the club's eight resident DJs has a different style, but there aren't set days for specific styles. Generally, hip hop is played from 11 p.m. to 12:30, followed by mainstream music to 3 a.m. and an open format from then to 4. There are also different parties every month with themes like rock, disco or Mardi Gras and customers invited to dress accordingly. The first-floor bar features an extensive selection of spirits, beers and cocktails (NT$200-600), while the upstairs bar has additional premium liquors and specialty drinks. 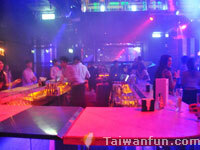 According to resident DJ Pyro, 18TC is currently the only pay-per-drink club in Taichung, which gives it an older, more upscale crowd. However, right now there is a special summer promotion on Wednesdays that includes "bottomless" beer until 1:30 a.m., and admission that day also includes a free entry for either a Friday or Saturday of the same week along with two free drinks. Light snacks and other food are also available, as are reserved 10-20 person table areas. Ask at the club about pricing, but basically there's a NT$5,000-10,000 minimum bill for these, which isn't a bad deal if you plan on partying at 18TC with lots of friends.